You are currently browsing the tag archive for the ‘Mammy Two-Shoes’ tag. Tom has been hanging out all night with three other cats. 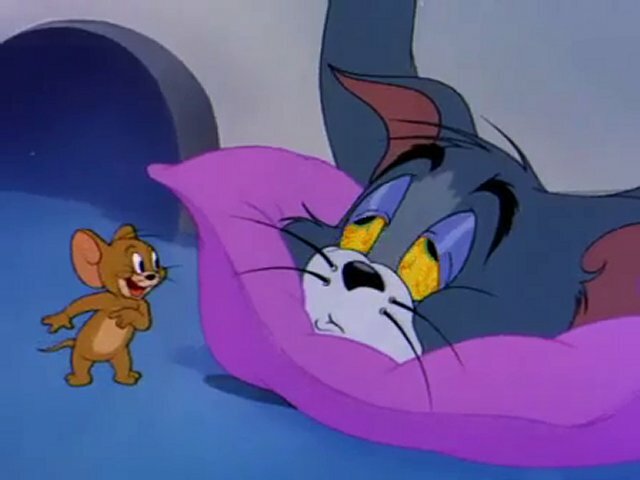 ‘Sleepy Time Tom’ is a hilarious cartoon with great gags and wonderful animation involving Tom’s feeble attempts to stay awake. Together with ‘Daffy Duck Slept Here‘ from 1948, its’arguably the funniest cartoon about sleep ever, outdoing other great cartoons like the Woody Woodpecker cartoon ‘Coo-Coo Bird‘ (1947), the Donald Duck shorts ‘Early to Bed‘ (1941), ‘Fall out-Fall in’ (1944), ‘Sleepy Time Donald’ (1947), and ‘Drip Dippy Donald’ (1948), or the similar Pluto short ‘Cat Nap Pluto‘ (1948). 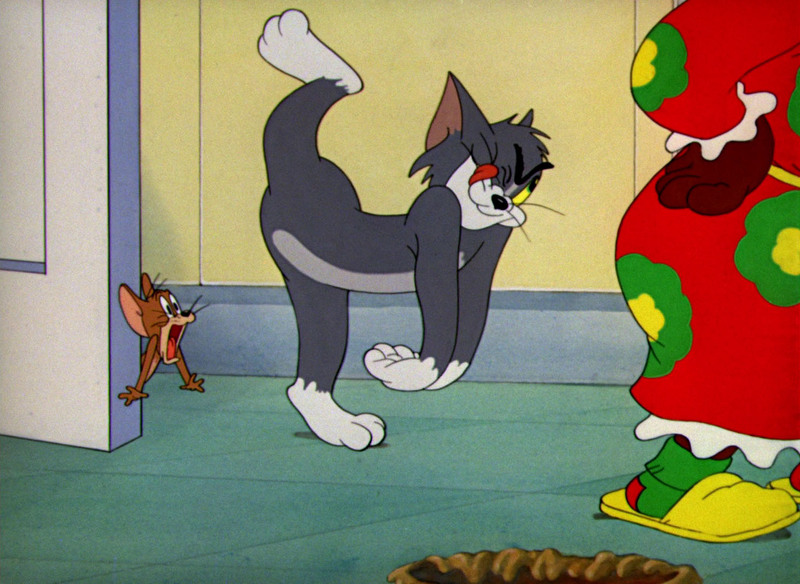 One may indeed consider ‘Sleepy Time Tom’ to be the last of the classic Tom & Jerry cartoons. 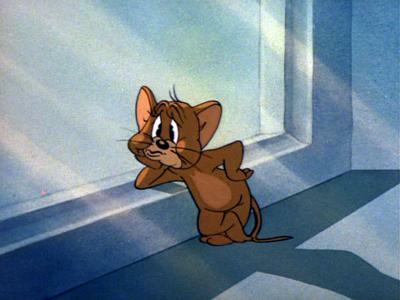 Although other funny Tom & Jerry shorts would be made in the years to come, the average quality of the designs, animation and stories would only diminish during the rest of the fifties. 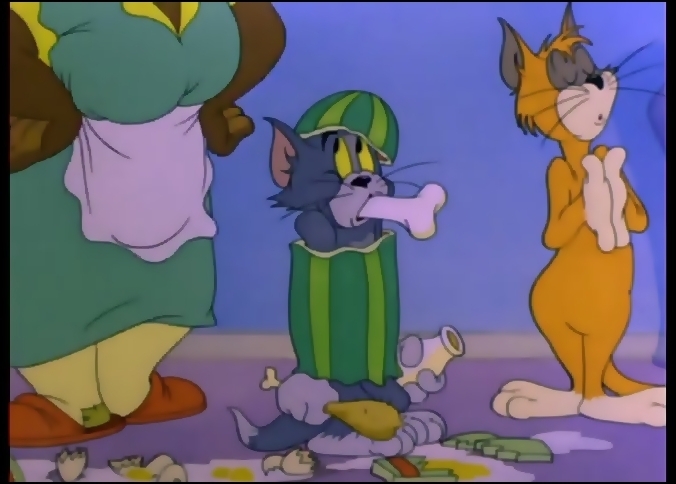 Mammy orders Tom to go out, in the pouring rain, so Tom fakes a cold to be able to stay inside bullying Jerry. 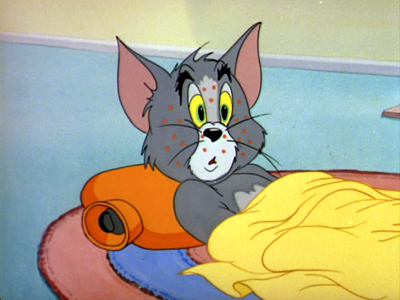 But Jerry elaborates on the idea, drawing polka dots on Tom, making him think he’s really ill, so the mouse can put extreme treatments on the cat. When Tom finally discovers the truth, they both really get the measles. 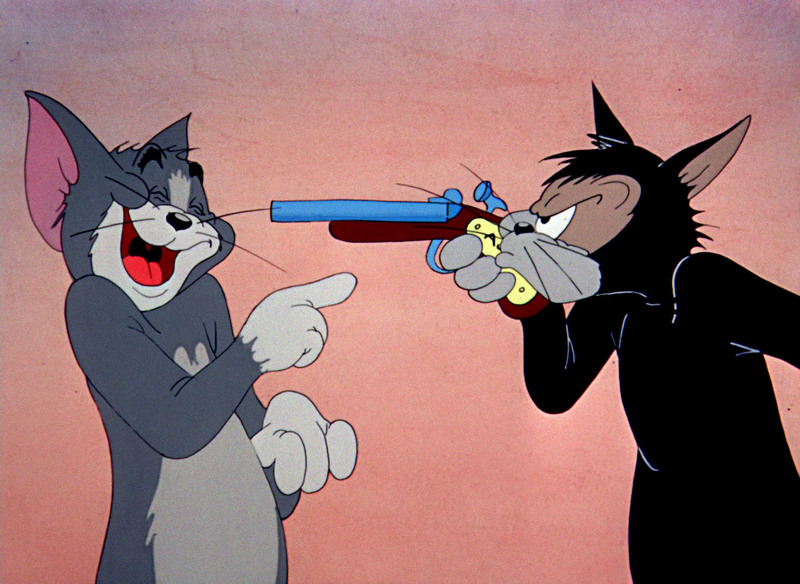 ‘Polka Dot Blues’ is a nice cartoon, albeit not among Tom & Jerry’s best. It contains some mild Tex Averyan takes, and a story line akin to the Donald Duck short ‘Donald’s Off Day’ (1944). 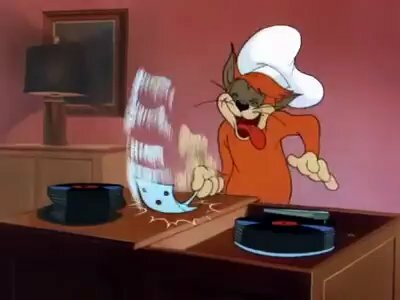 Jerry’s ‘treatments’ form the highlight of the cartoon. By chasing Jerry into the house, Tom dirts the kitchen floor, which just has been painstakingly cleaned by Mammy. She leaves shortly after, but not before warning him that if she’ll see one speck of dirt when she returns, she will throw him out. Jerry of course uses this threat to his advantage. 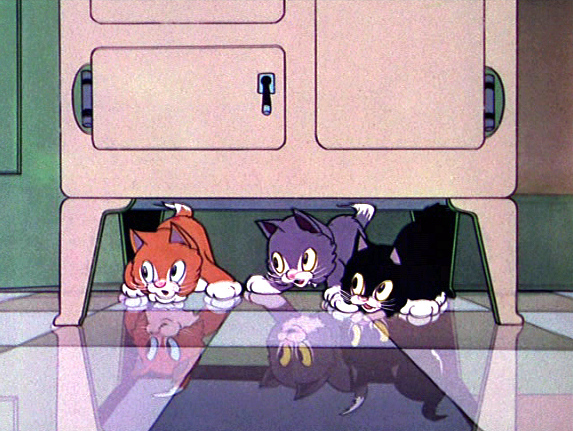 The plot of ‘Mouse Cleaning’ is very similar to that of ‘Puss Gets the Boot‘ (1940), Tom and Jerry’s very first cartoon, but the execution is much faster and funnier. 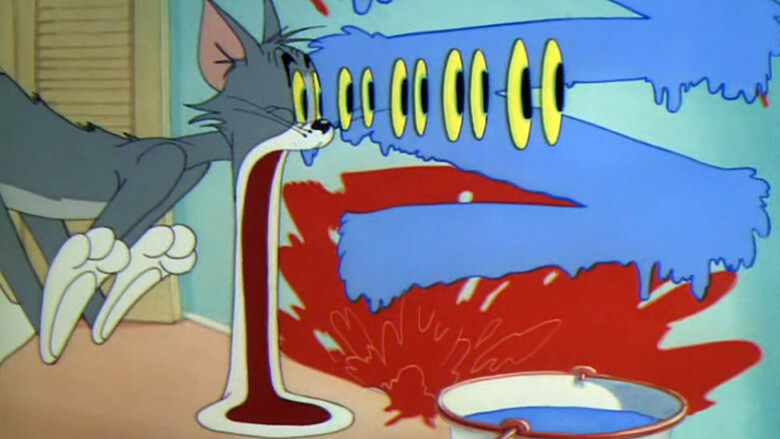 Tom & Jerry had come a long way since, as is shown by a particularly Tex Averyan doubletake, in which Tom produces multiple eyes and a drops his jaw unto the floor in surprise. 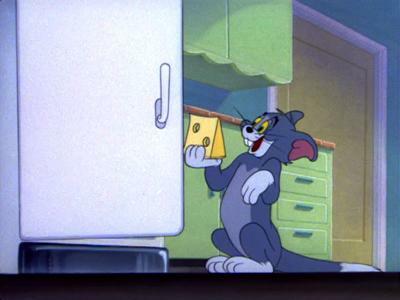 When Tom fails to catch Jerry, Mammy calls for ‘Lightning’, a red and literally lightning-fast cat, who disposes of Jerry in no time. This wonder-cat, however, doublecrosses Mammy by plundering the icebox and blaming it on Tom. So Tom is kicked out, too. But he and Jerry team up against the intruder in an equally unlikely as hilarious plot, which involves an iron and a magnet. A classic. Figaro and Cleo, the two animal sidekicks from ‘Pinocchio‘ (1940) star in this short, which is Disney’s first spin-off cartoon from a feature film (apart from some propaganda shorts). As J.B. Kaufman reveals in his insightful book ‘Pinocchio: The Making of the Disney Epic’, this short even features some left over animation that didn’t make into Disney’s second feature film. In ‘Figaro and Cleo’ the two animals are propelled into 20th century America and live in a mansion that’s kept clean by the Mammy Two-shoes-like character from ‘Three Orphan Kittens‘ (1935) and ‘Pantry Pirate‘ (1940). 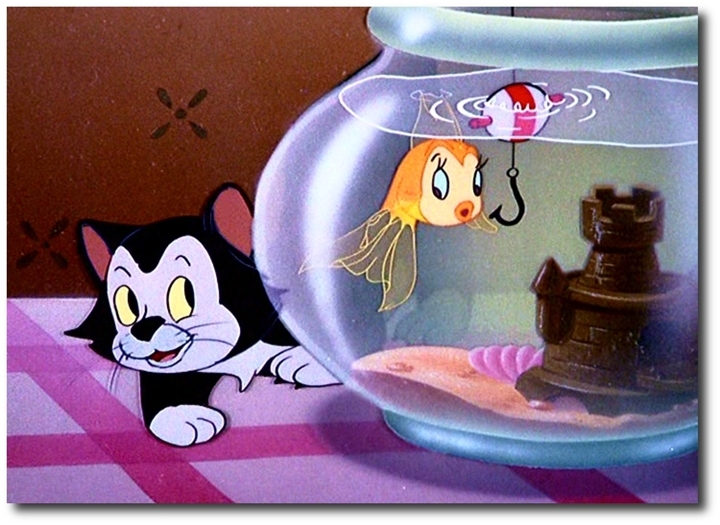 When Figaro doesn’t get his milk for punishment for his endearing misbehavior, he tries to capture the female fish Cleo, who actually seems to be in love with Figaro. First Cleo is saved by Mammy from Figaro’s clutches, but at the third attempt Figaro’s rescued by Mammy from drowning. In the end, the two are friends again, and Figaro gets his milk, after all. It’s surprising that this very cute, but remarkably unfunny cartoon was directed by Jack Kinney, famous for his hilarious Goofy films. The sweet tone is set immediately, as the cartoon starts with a sugary song by Ned Washington and Leigh Harline, reminiscent of some 1930s entries. This theme song would be used again in the two other Figaro cartoons. Besides these, Figaro would also appear in three Pluto cartoons: ‘First Aiders‘ (1944), ‘Cat Nap Pluto‘ (1948) and ‘Pluto’s Sweater‘ (1949). 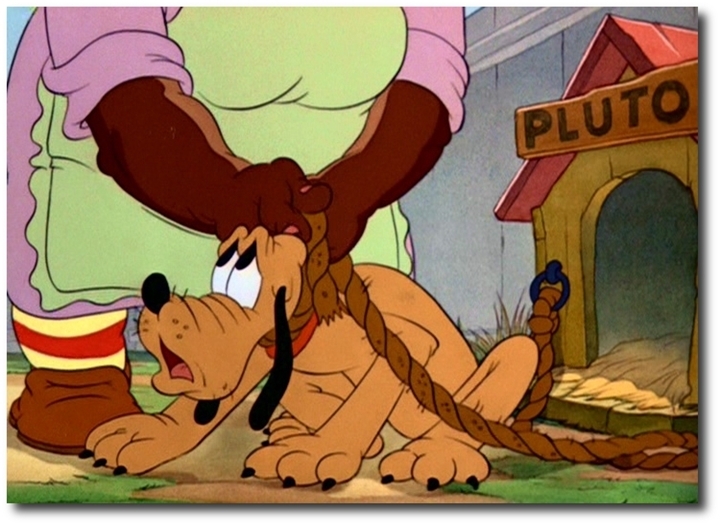 Surprisingly, in this film Pluto is not Mickey’s dog, but owned by an Afro-American lady, who seems to be the exact copy of Tom & Jerry’s Mammy Two-Shoes, who made her debut in February of that year. However, it was the Disney studio itself who had introduced the Mammy character in ‘Three Orphan Kittens‘ (1935). In ‘Pantry Pirate’ Mammy puts Pluto outside, but he sneaks into the kitchen trying to steal her roast beef. Hindered by an ironing-board, several tea cups and a bucket of soapy water, he doesn’t succeed, but he does escape Mammy’s wrath by quickly returning to his dog house, pretending to be asleep. Here the cartoon abruptly ends. ‘Pantry Pirate’ is the first of seven Pluto cartoons directed by Clyde Geronimi. It’s also one of his best, with gags leading to more gags in excellent pantomimed and physical situation comedy. This cartoon contains some remarkably flexible animation of Pluto, especially during the ironing-board scene. Pluto’s design, however, seems to be stubbier than usual. The Mammy character would return in ‘Figaro and Cleo‘ (1943).